Twitter’s devotees already respect the network as more than a series of text messages, but Agence-France Presse apparently does not. Their lawsuit against a photographer who uploaded photos to TwitPic underlines Twitter’s emergence as a legitimate news source–and competition. 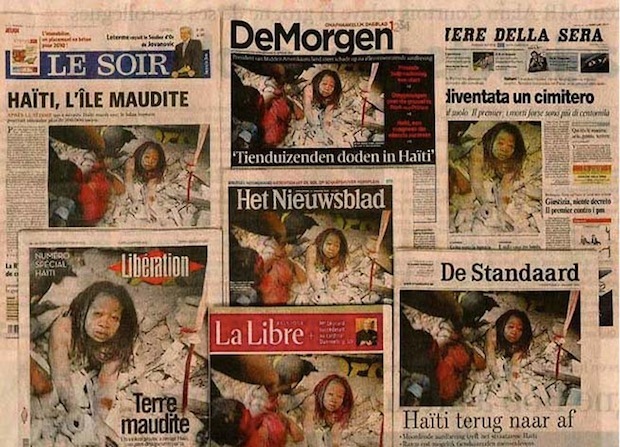 The Russian Photos Blog has a really fantastic timeline of Agence-France Presse’s interactions with one Daniel Morel, a photographer whose shots of Haiti immediately post-earthquake became the de rigeur illustrations of the trauma there. For the full, nearly minute-by-minute timeline, read the original post. I’ll lay it out quickly so we can get to the discussion of Twitter as a news outlet. Morel, a photographer formerly employed by the Associated Press, was in Port-au-Prince when the earthquake hit. He uploaded 13 shots to a newly created TwitPic account, and linked to them on a new Twitter account. Within 10 minutes, some jerk named Lisandro Suaero copied them, uploaded them to his own account, and claimed that he had taken the exclusive photos. About four hours later, Agence-France Presse (one of the three major western news agencies, along with AP and Reuters) snagged the photos from Suaero’s account and began offering them for licensing. The photos became the shots of post-earthquake Haiti (see the top photo in this post). Morel, after realizing what had happened, sent cease-and-desist letters to AFP. A few days after, AFP responded not with an apology or settlement offer, but with a lawsuit, for “making false and disparaging statements.” Morel hit back, AFP hit back further, and research done by the Russian Photos Blog shows contact between AFP and Morel that strongly suggests (that’s don’t-sue-me-speak for “proves”) that AFP had full knowledge that the photos were Morel’s, and simply did not understand that there are actual rights given to materials uploaded to services like TwitPic. AFP, like a lot of more established organizations, seems unable to change their perspectives on Twitter to address what the service actually is. That Morel posted some of the most important photos of the decade on Twitter before any other publication shows the power and flexibility of Twitter as a legitimate news service. AFP’s argument, that Twitter is in some way nothing more than a digital bulletin board with no accompanying rights, is worrisome–it’s a different kind of news outlet than AFP, but that doesn’t mean its value in news can simply be ignored. As Jeremy Nicholl says, “the whole situation is a mess.” AFP’s position might not hold much water, legally. But if the AFP does manage to get away with, in essence, scraping a photographer’s work and selling it simply due to the venue in which it was published, both Twitter and new media journalism have serious problems to overcome.